Hey you. Yes, you. If you work at or participate in any of the following: Mervyn M. Dymally Institute, PACE, EOP, Women’s Resource Center, or if you participate in any of our 12 student support programs, this pertains directly to you. The long-awaited move into the new Student Success Hub on the third and fourth floors of the library is expected to happen between April 12 – 28, primarily on weekends. The programs have been housed in temporary spaces around campus, including Welch Hall. The Bulletin has the scoop on the new space, so listen up. On Mar. 28 photographer Glenn Marshall and I donned a couple of hard hats and fluorescent vests to tour the Student Success Hub. The hub is still under construction, with crews working hard to ensure that they meet the April deadlines. Director of Facilities Planning, Design and Construction Roshni Thomas led the tour of the space. 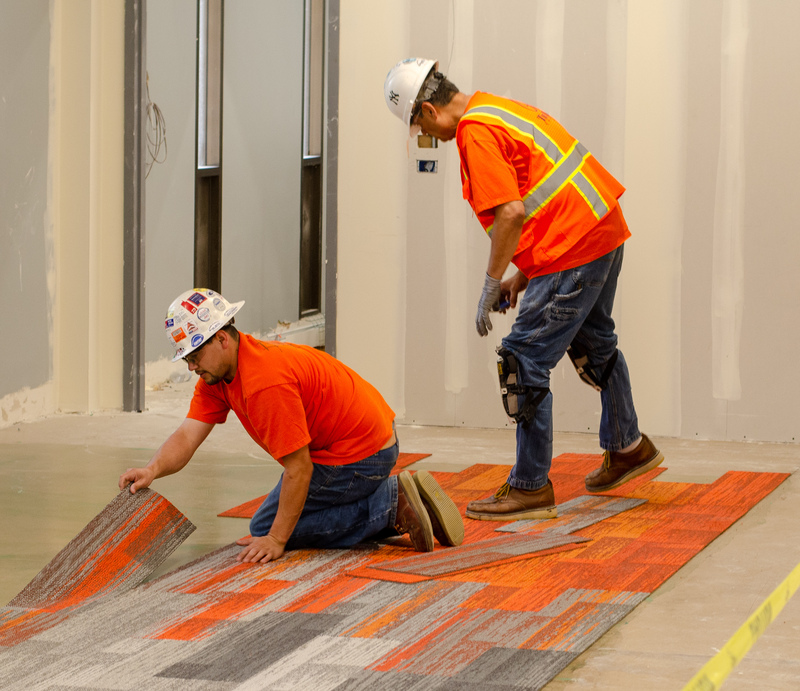 The cavernous room is broken up by vibrantly colored carpet tiles to indicate the individual programs working space. Cubicles standing around 4 feet are lined up to provide privacy for meetings and work tables will be set up with connections for laptops which can be checked out through individual programs. Thomas indicated the various spaces where programs would be. “[These programs are on the third floor] Student Affairs, basically anything that is on the third floor of Welch Hall, EOP, Career Services [etc. ]” said Thomas. The Bulletin will also join the programs on the third floor, with an open space lined with a series of white desks to create an open space. The Student Success Hub is being installed as a replacement for some of the offices that will be lost when the Small College Complex is demolished. The SCC will be replaced with the Innovation and Instruction building set to finish fall of 2021. The imminent demolition of the SCC means a loss of 18 classrooms and offices. The idea is that many of those offices will find a new home in the space. Beyond the need for new space, the working theory is that the open floor plan will promote collaboration between the departments and an overall more successful campus. If nothing I have said pertains to you or excites you in any way, then take the consolation prize that a Starbucks will be opening on the ground floor of the library. Grab your skinny vanilla latte with extra foam and a pump of caramel and check out the new space.